Save Up To $1000 Until February 28! If crooked teeth have stolen your self-confidence, we understand. We are passionate about helping patients enhance their appearance and achieve a stunning smile. That’s why we are pleased to offer this special discount on Invisalign® invisible orthodontics. This offer also includes free bleach and retainers. To make the treatment even more affordable, we offer financing through CareCredit®. And just like traditional braces, Invisalign® is covered by insurance. Call Palmetto Smiles of Charleston at (843) 554-3300 or book your Invisalign® consultation online now. Hurry, this offer ends February 28, 2019! 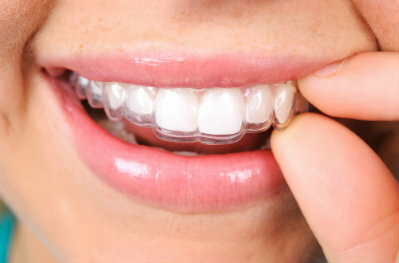 Invisalign is ideal for those age 12 and older who have their permanent teeth. For individuals with severe crowding, fixing the bite first may be necessary to straighten the teeth. Invisalign® is an excellent choice if you only have mild crowding or if you’ve worn braces before but would like to straighten your teeth again. Unlike traditional braces, which use metal brackets and wires, this method of straightening teeth uses clear, custom-crafted aligners to gently shift your teeth over time. Dr. Julian Campbell is an Invisalign® preferred provider and will customize a treatment plan to help you achieve the results you desire. Book your Invisalign® consultation – call Palmetto Smiles of Charleston at (843) 554-3300 or book online now. Hurry, this offer ends February 28!